Recently we were lucky enough to win a family pass to any National Trust site, so with Easter weekend upon us we decided to combine it with an Egg hunt and a trip on the ferry to Brownsea Island. The weather was really sunny yesterday, but a little windy. When the ferry was still it was lovely basking in the sun, but during the trip across we were all a little chilly. Once on the island, we made our way to the start of the egg hunt, and Miss A sat down to make her hat to become an Eggsplorer. We were ready to set off with our clue sheet and cameras. Miss A likes to take pictures of anything and everything at the moment, and she was in special charge of my old camera today. Brownsea Island is 1.5 miles long and 3/4 miles wide. Our egg hunt took us on a walk around the island. We didn’t rush and stopped to look and some of the peacocks showing off, exploring the woodland, picking up sticks. We spotted some friends that had come over for the day walking across a sunny patch of field. 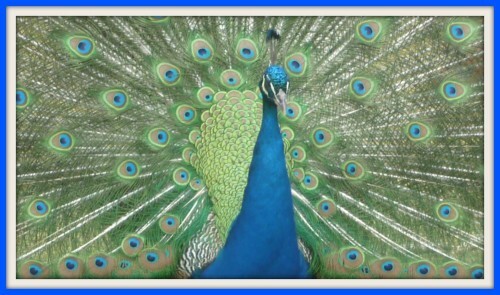 This one particular Peacock was showing off for the crowd in front of two Peahens. It was funny to watch, and he paraded around in full circle for plenty of us to take photos from all angles. Miss A took a brilliant photo of the peacock, up close and personal, and he posed beautifully for her. With the recent bad weather, there were some trees that had been felled, and chopped up after falling. It gave the children lots of opportunity to climb and explore between the trunks. Some of the larger trees were stamped with their dates of approximate planting and fallen date. Back at “base camp” it was time to collect the reward for completing the egg hunt. I had to convince Miss A to share her egg with us. We had a long wait for the ferry home as I think everyone wanted to leave the island at the same time, but on the return journey we sat below deck and we were much warmer on the way home. Looks like you had a great day, love the peacock and the fallen trees look great to explore. Unfortunately I couldn’t convince my 2 to share their eggs, so they ate half yesterday and have saved the other half for today! Love those peacocks! It really gets a bit chilly when you travel near the sea aint it? We went to the coast yesterday too and it got a bit windy even when the sun is so bright. But fun nonetheless like your trip. Love to visit there! Look so interesting! That sounds and looks like a brilliant day out! Looks like a really fun day out. I love peacocks!